Number of clients requesting treatment for opiate use related problems continues to decline. 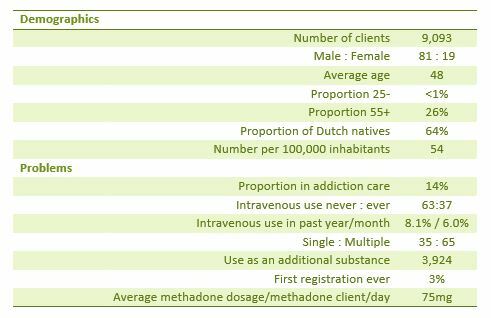 97% of the clients requesting treatment for opiate use related problems from 2015 had previous treatment or are still in treatment. Intravenous use is declining; 6% of the people requesting treatment have injected during the past month. Treatment demand for opiate use related problems has decreased over the past 10 years. Over 9,000 people have been registered with opiate use related problems in 2015. In 2006 these were 13,500 people. About 97% of the clients are ‘old acquaintances’. The number of newcomers is limited, and there is relatively little outflow. Addiction care for this group mainly consists of ‘care’. That means that treatment is focused on ‘harm reduction’ rather than abstinence.